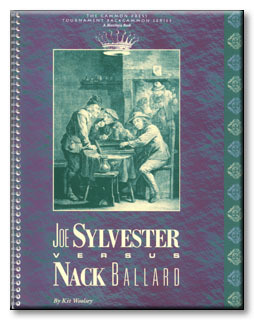 NOTE: The text of Joe Sylvester versus Nack Ballard originally appeared in machine-readable form as part of the MatchQiz series. U.S. Open, Reno, Nevada, June 1989. Preliminary match, 19 points. COVER: Joe Sylvester and Nack Ballard are two of the "Top-10" players in the world. In this bookone of a series of annotated match books available exclusively from The Gammon Pressworld-class strategist Kit Woolsey takes you behind the scenes to show you how these champions plot their moves and how you can use their insights to improve your play.